RARE OPPORTUNITY to take over a stunning space that has been anchored in the community since 2003. Continue and fine-tune the existing concept or it would make an AWESOME Mexican/Southwest/Modern Mexican conversion at a fraction of the cost it would take to build out a space of this caliber. 4000 sq feet inside as well as a 1000 sq foot freestanding storage space and office. Immaculately maintained and pride of ownership shows throughout. Owners willing to rewrite new lease with favorable rates and terms. The bar has 22 stools, 8 deuce high-tops, 4 four-top booths and 1 six-top booth. There are 3 additional four-tops and 2 six-tops as well to the rear of the bar. There is a section of the dining room that is set up with 10 four-tops and it can be sectioned off in to a private party room. There is a patio that has 3 deuce benches, 3 easy chairs, 2 deuces, 2 six-tops, 2 quads as well as a GORGEOUS water-wall and fire wall feature. In addition there are 3 flat screen t.v.’s, an indoor fireplace, a POS as well as a video surveillance system in place. This restaurant and bar has HUGE upside with a working owner! Sales for the past three years have run at the $2 million mark with adjusted cash flow in the $259,000 to $360,000 range. In 2016 sales were $2 million with adjusted net cash flow of $259,000. But that being said, the restaurant and bar needs a working owner. An SBA Loan is available for the right qualified buyer as there is no issue getting one for this business. SBA LOAN: Put 30% down ($135,000) and the monthly payment will be about $3,800 for 10 years at 6.5% interest. This business in 2016 cash flowed about $21,600 a month on average. What a great investment and return! 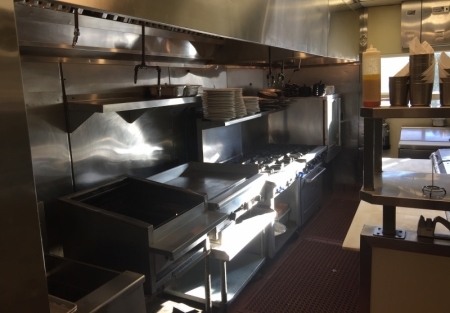 The kitchen will accommodate any menu and includes a 17” hood with a convection oven, 6 burner with oven, 2 Pitco fryers, Wells 3’ griddle and a 2’ Bakers Pride Char Broiler. Other FF&E includes Robot Coupe, Scottsman ice machine, walk-in refer and freezer, Hobart Mixer, Berkel slicer and 3 refrigerated prep/pantry tables. Eclectic menu with creative appetizers, soups, salads, burgers, sandwiches, pizza, flatbreads, entrees and desserts. 7 Full time; 25 Part time. 3 managers provide and excellent opportunity to cut labor costs as an owner operator and increase bottom line.